Juggling multiple storylines and forced to split the overall story into five parts, it is here in Part Four that Leonard Starr almost loses his footing. While this episode does feature some excellent character moments, and while Starr continues to build upon themes established in earlier episodes, it’s the logistical bones of the story that begin to weaken. Animation-wise, there’s not much to tell; Part Three sucked up all the resources, leaving Part Four mostly mediocre-looking. Exceptions include some of the firelit Berserker bits, the reveal of Fire Rock Mountain as Lion-O approaches it in the SkyCutter, and the final freeze frame. The cliffhanger from Part Three is resolved in a sensible way: sunlight destroys the mummy wrappings. What’s not so sensible is that Lion-O was trapped there all night, and yet Mumm-Ra made no effort to capture him in earnest. 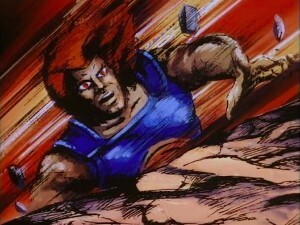 Worse, though, is Lion-O suddenly knowing that the Thunderians are being held at Fire Rock Mountain. 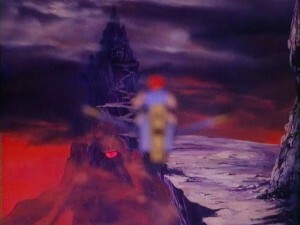 Previously clueless, he went to the Pyramid to ascertain their whereabouts and investigate Mumm-Ra’s involvement. Now, after interacting with Ma-Mutt and some old toilet paper, he just knows. Even worse, he acts as if he’s known all along. This is Starr’s biggest flub. Equally confusing are the times of day in various scenes—time seems to be fragmented from one storyline to the next without any care for greater continuity. 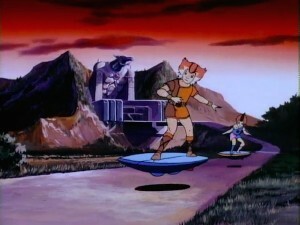 Lion-O’s story resumes at dawn and ends as the Kittens depart Cats’ Lair at sunset. The conclusion of the Hook Mountain storyline is set in daylight, after we left it at sundown. 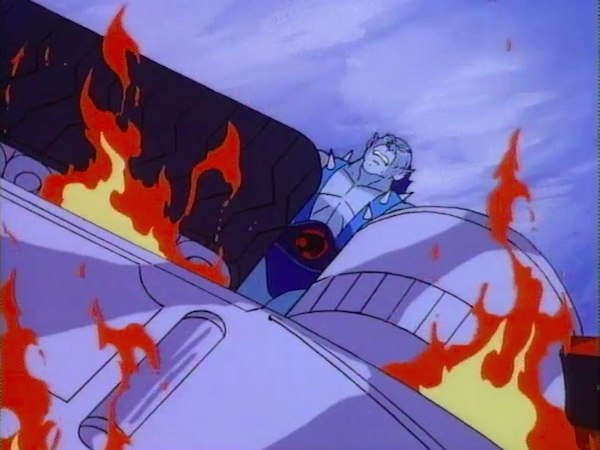 This implies that Panthro was pinned under the burning ThunderTank all night, while Tygra and Cheetara were… mustering all their ThunderCat strength. Snarf’s storyline in Tuskania similarly lasts all day and into the night, which works in isolation, but implies that the Gomplin and the ThunderKittens must fly all night to meet up in daylight in Part Five. These inconsistencies are only bothersome if you’re really paying attention, though. On the surface, the story continues to move along, with several scenes standing out. Ratar-O’s battle with the Tuskas, while not very well-animated, is exciting nonetheless. Ratar-O barking orders to Vultureman from outside the Ratstar, along with his confidence against what amounts to an entire army, perfectly reflect his inflated ego. Hammerhand using TopSpinner as a motor for the broken lifeboat is both genius and hilarious, and the scene’s music gives it a sense of both high energy and comedy. 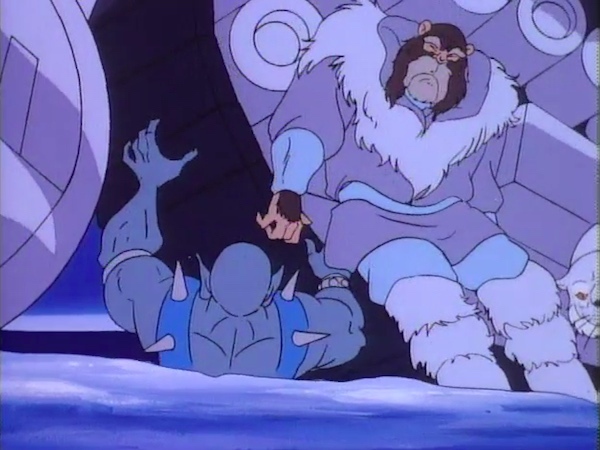 Finally, the rescue of Panthro from under the Tank is especially rousing: it showcases the new vehicles, lets Snowman’s determination shine through, and reinforces the value Panthro places on the Thunderians’ lives. Snarf, like Panthro, continues to drive home the theme of doing whatever it takes to help one’s friends. 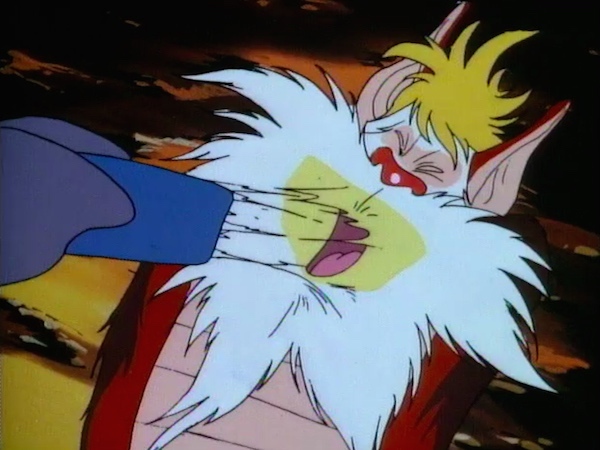 He sabotages the Ratstar while bound and gagged, rather than see Ratar-O decimate the Tuskas. He and Turmagar also take it upon themselves to thwart Hammerhand’s plot, and they free the RoBears in the process. 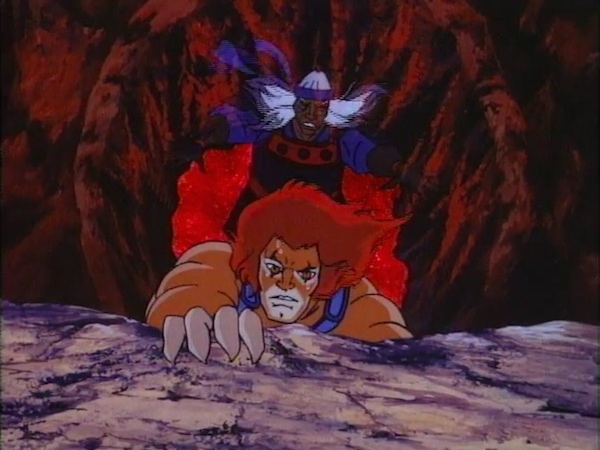 Even Lion-O gets in on the selfless game, rescuing Hachiman despite the danger posed by the thundranium. Perhaps best exemplifying this thematic thread, though, are the Thunderians. 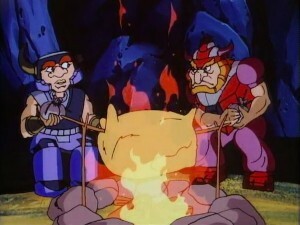 Imprisoned in Fire Rock Mountain, their urge to escape is galvanized when they hear S-S-Slithe and Monkian discussing the trap laid for the ThunderCats. Prisoners themselves, they eschew victimhood and instead feel an obligation to save their saviors. You can’t get more selfless than that. The inclusion of the Tuskas deserves a word. While the appearance of Snowman, Ratar-O, and Captain Shiner in Part Two smacked of mild pandering to LJN, the Tuska warriors here in Part Four are a blatant toy commercial. Their uniforms and weaponry have been tweaked since their appearance in “Turmagar the Tuska” to better resemble the action figure, in particular the T on their belts. 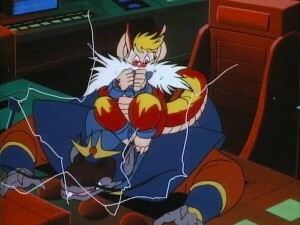 And yet, bringing Snarf to Tuskania gives Leonard Starr the opportunity to explore Turmagar and his Gomplin—characters not of his creation whom he handles deftly. More than that, the incorporation of Tuskania, known to be distant from the ThunderCats’ neck of the woods, helps make the adventure feel like it’s covering a larger geographic area. Together with the sea approach to Fire Rock Mountain, Third Earth suddenly feels like a bigger place: grander, but more interconnected somehow. For this worldbuilding, Starr can be forgiven his glaring advertisement: he’s continued to expand and flesh out the world of the story, and he’s set us up for a neatly-tied bow of a conclusion. 1 ^ Leonard Starr gave each part a working title. Part Four’s was “Return of Hachiman”. 2 ^ The Kittens follow what appears to be a paved road or sidewalk in this shot. 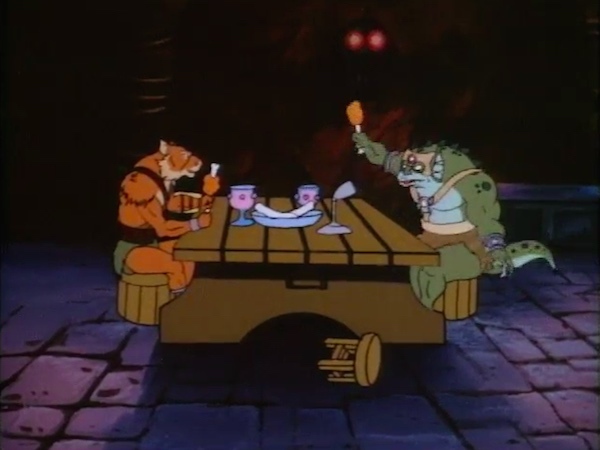 3 ^ In Part Three, Lion-O sends Tygra and Cheetara off to “muster all [their] ThunderCat strength”, which presumably means gathering everyone together to later assemble somewhere. It’s unclear why this would take all night, or where they intend to assemble. 4 ^ Snowman is completely absent from this scene in a draft of the script, and possible from the final recording script. His two lines of dialogue could easily have been lifted from “ThunderCats Ho! Part Two” and “Lord of the Snows”. This episode marks Ratar-O’s final appearance in the series, as the Ratstar plummets into the ocean. We know from “ThunderCubs”, though, that Vultureman manages to salvage the Ratstar. 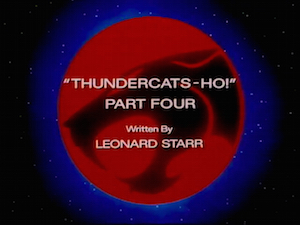 A standalone movie version of “ThunderCats Ho!” was edited differently, with some scenes truncated or missing altogether. In Part Four, these edits included the tightening of the Berserker’s discussion around the campfire to include only talk of their next moves, cutting any squabbling over their respective shares of gold. Jackalman enjoys his time at Fire Rock Mountain much more obviously in the script than on-screen. He is described as having “his feet up on the table, chewing on a meaty bone.” He takes a swig from his goblet, tosses the bone over his shoulder, wipes his mouth with the back of his hand, and guffaws, “Hah!” after S-S-Slithe mentions the responsibility of guarding the prisoners. In the script, WilyKat makes the astute observation that the cat signal will draw the enemy to Fire Rock Mountain as well. Why has this never happened before? !